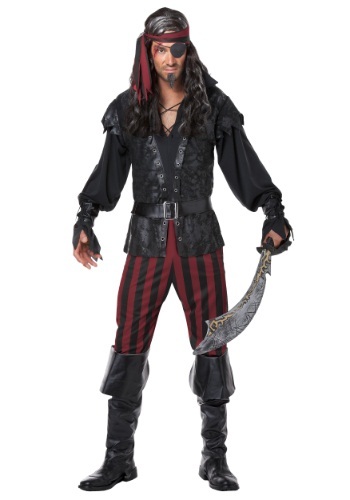 Perfect for the pirate who follows nobody's rules, not even his own! What's the one thing worse than being attacked by pirates when you're out on the high seas? Besides running out of rum, of course? For our money, it doesn't get any worse than being attacked by rogue pirates! When you show up to the party in this Ruthless Rogue Pirate Costume, you'll shiver everyone's timbers! But, that just means you get to keep all the treasure you find for yourself, and you can dress in menacing costumes like this! The battle-worn outfit includes a leather-like vest and striped trousers, which look very sinister when combined with the matching head tie and black vinyl accessories. Add a fearsome pirate sword and an eye patch if it suits you, but when you already look this ruthless, you may not even need them to win your battles!